A faculty recital by Gwen Krosnick ('08), cello and Lee Dionne, piano. Described by the Daily Forward as “an exuberantly gifted cellist,” Gwen Krosnick has played across the world as a joyous communicator and advocate of music. In her life as a chamber musician, educator, and concert presenter, Krosnick creates space for audiences to connect and react; champions serious contemporary music; and – through her thoughtful, adventurous programming – encourages a lively dialogue between great pieces of music, old and new. Krosnick’s 2016-2017 season includes an exciting mix of recitals (with pianist Lee Dionne), chamber music collaborations (including concerts in Vermont and Maine featuring Kneisel Hall faculty and alumni), debuting a new concert series (The Boston Beethoven Cycle) at home in Boston, and serving on the faculty at Oberlin Conservatory as Visiting Instructor of Cello. Krosnick was the founding cellist of Trio Cleonice and performed with them across the United States, Europe, and Asia. A review in the group’s final year said of Krosnick: “Her playing is marked by a passionate temperament and a strong, rich sound, as well as a formidable technique. She acts the music with her expressive face and body; in fact, she becomes the music” (The Reading Eagle). In the trio’s eight seasons together, they appeared at venues such as Jordan Hall in Boston, the Kennedy Center in Washington, D.C., and the Concertgebouw in Amsterdam, and garnered top prizes at the Schoenfeld and Arriaga Chamber Music Competitions. Krosnick’s newest playing-curating project is The Boston Beethoven Cycle, which features a chronological voyage through Beethoven’s complete string quartets over the course of three seasons. Krosnick is a ferocious and exuberant advocate of new music; and the series, to that end, presents Beethoven’s revolutionary quartets alongside solo contemporary masterworks by Ralph Shapey, Elliott Carter, Donald Martino, John Harbison, Roger Sessions, Tibor Pustzai, Andrew Norman, Christopher Theofanidis, Richard Wernick, and Thea Musgrave. 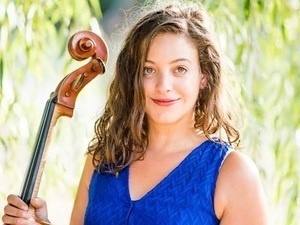 Krosnick studied at Oberlin College and Conservatory, where she received a Bachelor of Music Degree as a cello student of Darrett Adkins and Dmitry Kouzov in addition to a Bachelor of Arts degree in Russian Language and Literature. She most recently studied with Natasha Brofsky at the New England Conservatory, where she received a Master’s degree and coached with Vivian Weilerstein. Krosnick spent many summers at Kneisel Hall and Greenwood Music Camp; she was a longtime participant at Yellow Barn, where she collaborated with artists such as Anthony Marwood, Violaine Melançon, Maria Lambros, Alan Kay, and Donald Weilerstein. Krosnick’s central musical influence, since childhood, was the Juilliard String Quartet: her father, the cellist Joel Krosnick, as well as the quartet members whose playing she heard live growing up – Robert Mann, Joel Smirnoff, Ronald Copes, and Samuel Rhodes. Her other most impactful teachers included the great pianist Seymour Lipkin, violinists Laurie Smukler, Mark Sokol, and Geoff Nuttall, and music theorist Brian Alegant. Away from the cello, Krosnick’s focus mimics her joyously-varied musical life: she is Mom to Anya, a wonderful Australian Shepherd rescue puppy; continues her Russian language studies; practices yoga, reiki, and meditation; and is a passionate and accomplished home cook – specializing in classic, mostly-vegetarian, intensely-flavorful Italian food. Pianist Lee Dionne holds passion, imagination and play at the core of his artistry. Currently based in NYC, Lee enjoys an active career as both a soloist and chamber musician, performing frequently as a core member of Cantata Profana and with Ensemble Connect (formerly Ensemble ACJW, a joint program of Carnegie Hall, the Juilliard School, and the Weill Institute). Through this last organization as well as his own freelance work, Lee cultivates a particular interest in creating performances that help audiences form personally relevant connections with music. His experience here has ranged from presentations tying performance to analysis for audiences of musicologists — to short introductions of specific pieces for elementary school classrooms. Lee has performed in venues throughout the US and around the world, including solo appearances in Weill Hall, the Concertgebouw in Amsterdam, and the Philharmonic in Bratislava. As a chamber musician, he has appeared at the Staunton Music Festival, Yellow Barn Music Festival, and Norfolk Summer Music. Lee’s performances have been broadcast live on NPR, Britain’s Classic FM, Holland’s Classic FM, and Portugal’s Antena 2, and he has made commercial recordings for MSR Records and Naxos. Lee is currently a doctoral candidate of the Yale School of Music and a candidate for the soloist diploma from the Hochschule für Musik, Medien, und Theater in Hannover, Germany. He holds an MM and MMA in Piano Performance from the Yale School of Music and a BA in literature from Yale College. His major teachers and influences have been Boris Berman, Wei-Yi Yang, Matti Raekallio, Patricia Zander, Arthur Haas, Michael Friedmann, Paul Berry, and Wilma Machover.